Inexpensive Windows companion. 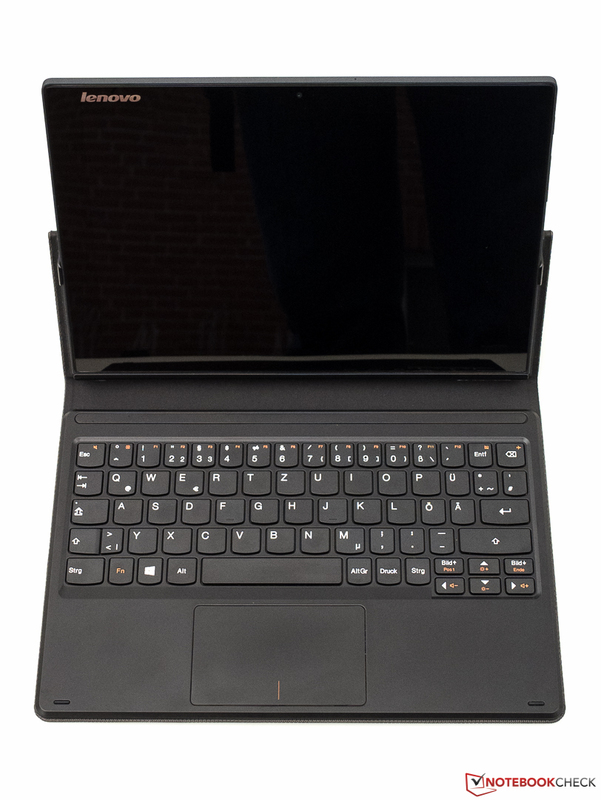 In the shadow of its expensive Yoga lineup, Lenovo has launched an affordable office tablet with a practical keyboard cover that convinced us in the test. Our in-depth review reveals more about its performance, screen, build, as well as other aspects. 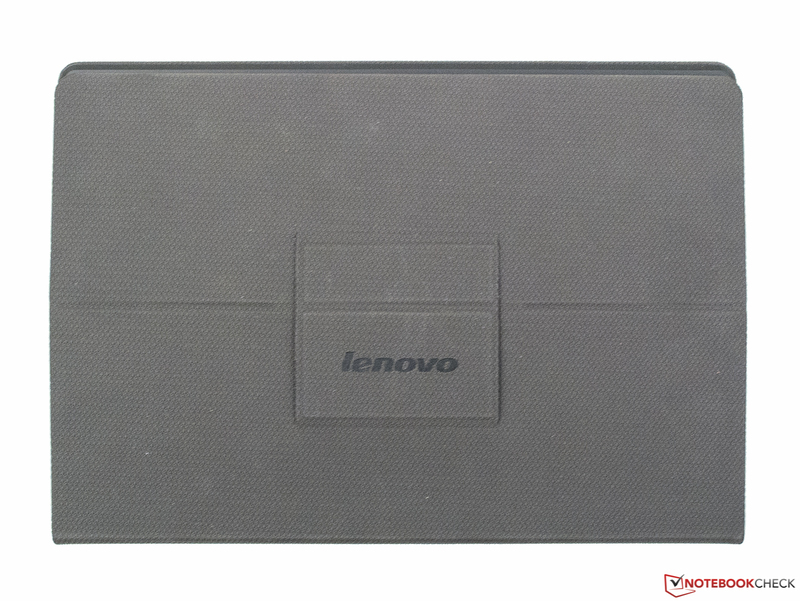 When talking about Lenovo tablets based on Windows 8.1, the well-known Yoga lineup that Lenovo aggressively advertises is usually meant. However, it now faces company-made competition. After the Miix 3 10 and Miix 3 8 were sighted only in China in late summer, they simply appeared in German shops without big advertising campaigns or events late November 2014. 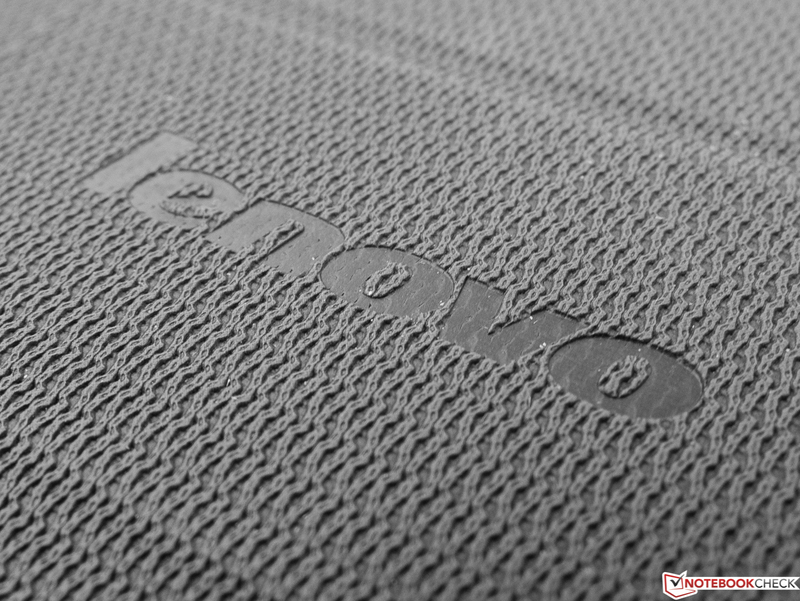 Lenovo probably avoided a big ado on the German market so that potential customers prefer the more expensive Yoga lineup, which is likely more profitable for the manufacturer. 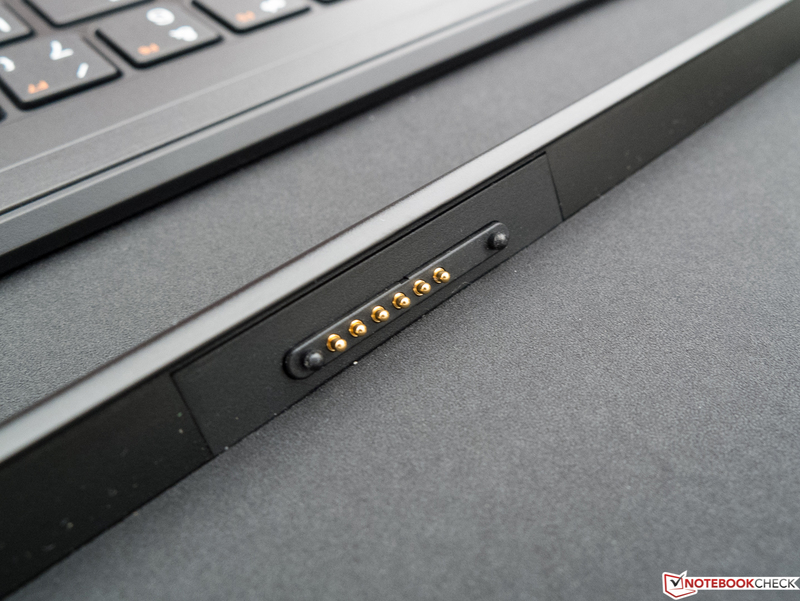 This restraint is very appropriate from Lenovo's point of view. When comparing the newcomers' specifications with the Yoga counterparts, it is quickly seen that the Miix 3 tablets can certainly keep up with them despite their considerably lower price. 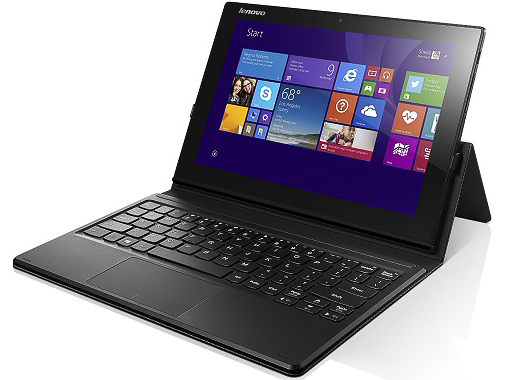 We will focus on the just 300-Euro (~$335) expensive Lenovo Miix 3 10. It has a 1920x1200 pixel IPS screen, an Intel Atom Z3735F quad-core (4x 1.33 - 1.83 GHz, no Hyper-Threading, TDP: <4 watts), 2 GB of RAM, and a 32 GB flash memory. It is shipped without a stylus, but a keyboard cover with a stand is included. The latter is not a cheap membrane keyboard unit. 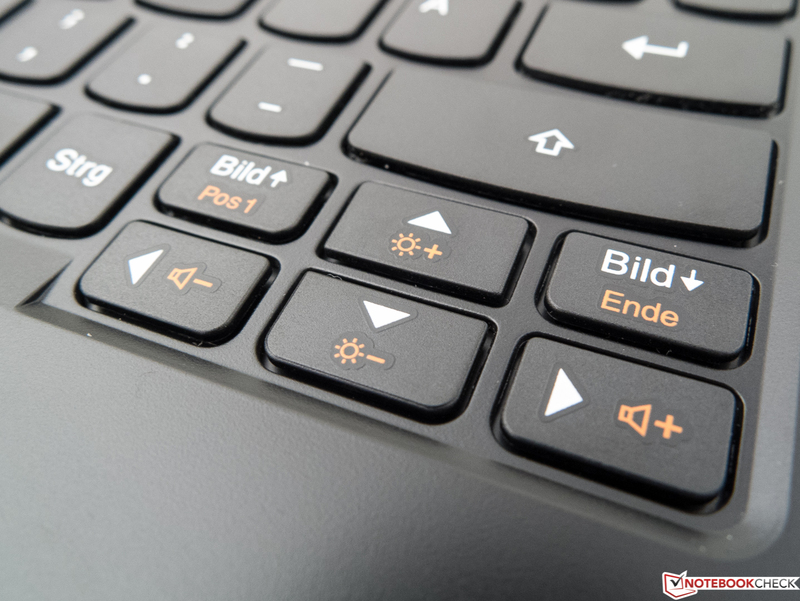 Instead, Lenovo integrates a kind of hard-plastic base with a real chiclet keyboard alongside a ClickPad in a useful size. 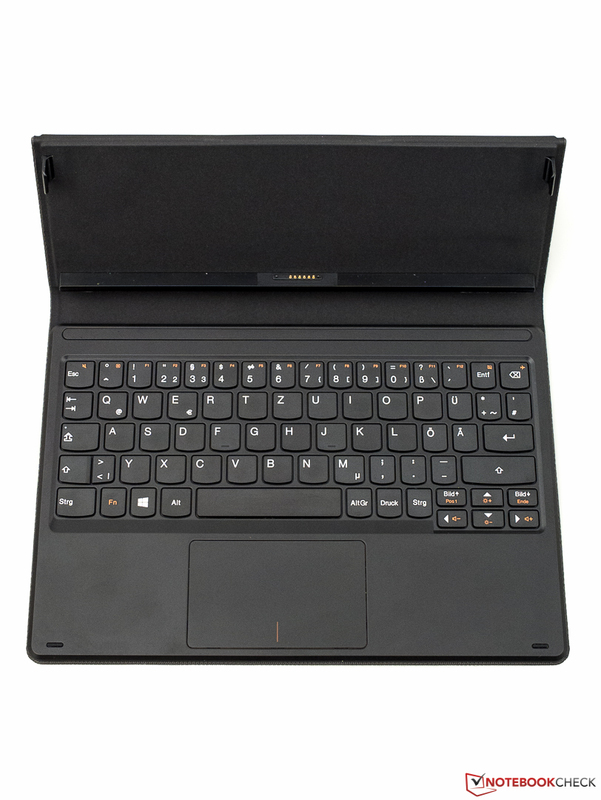 Users who are at home in the Windows world and are looking for a mobile and flexible supplement for their home PC or laptop might be attracted by the Miix 3 10. It can be used as both a classic tablet and a kind of netbook in conjunction with its cover. However, it should be clear that the cover does not sport any additional interfaces. Netbooks and very small laptops remain superior in this regard. Besides that, there are no mobile communication modules installed. A potential target group might be students who want to use Windows on-the-go at university and where a Wi-Fi network is usually available. 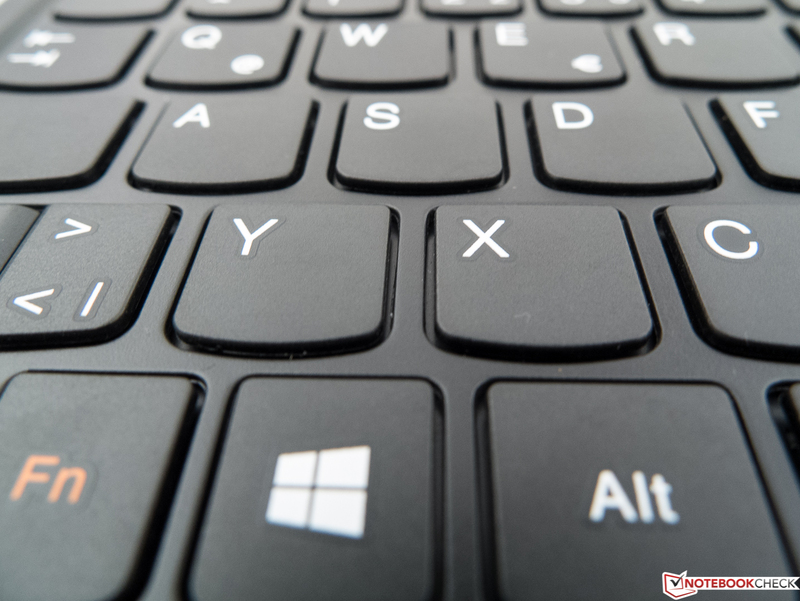 In addition to the almost full-sized keyboard, the preloaded Office 365 with a one-year license suggests that Lenovo sees mobile work as the main field of use for the Miix 3 10. It is logical that we selected two identically designed and (now) also similarly priced tablet convertibles for comparison in this test. 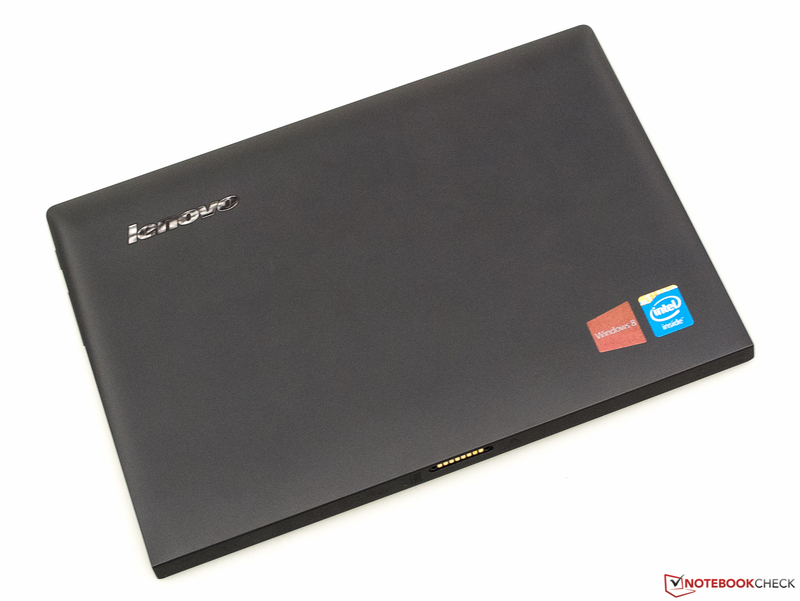 The ODYS Winpad V10 that we tested in December 2014 for just 250 Euros (~$279) is based on the same SoC, features 2 GB of RAM, an IPS screen with 1280x800 pixels, and a 32 GB flash memory. 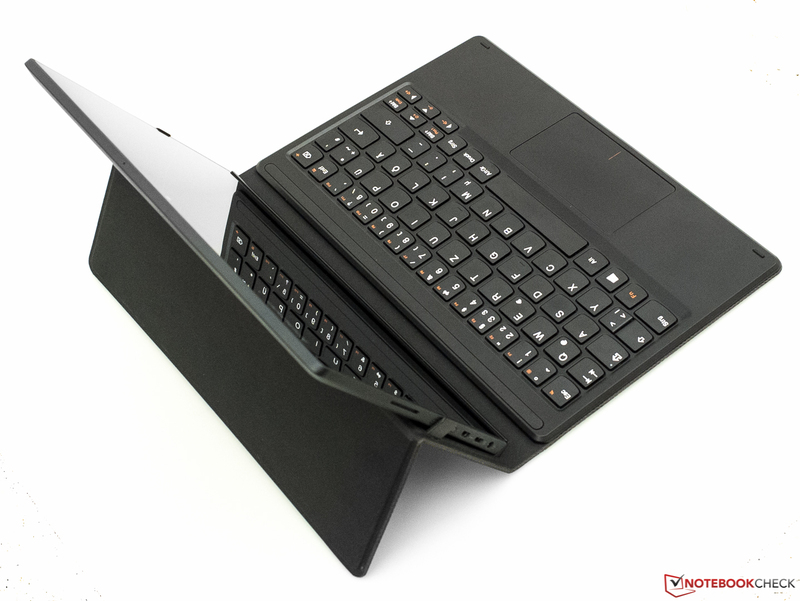 It does not include a cover, but it has a solid keyboard dock with a weight of 700 grams. 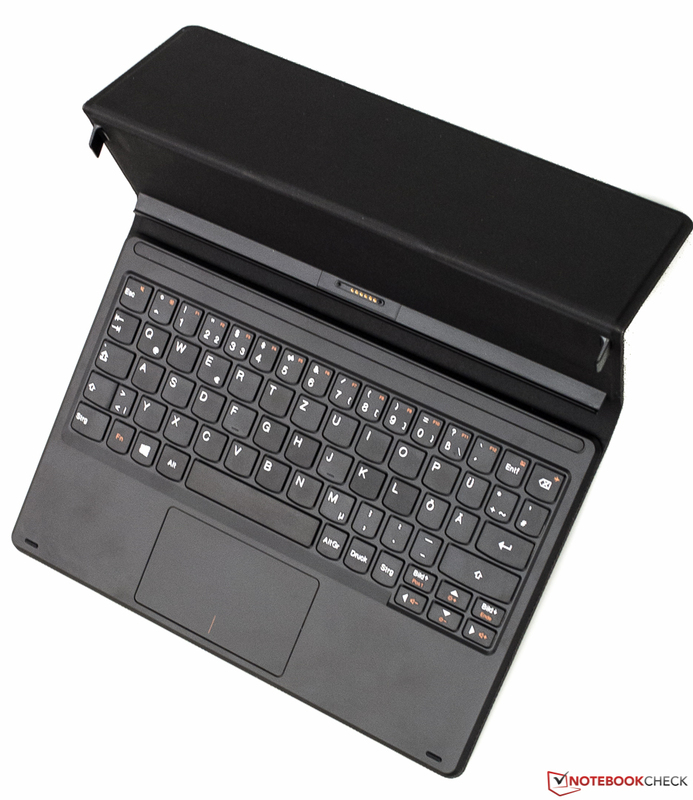 It looks a lot like a conventional netbook when the tablet is inserted. The same is true for the third participant. The older yet still available Asus Transformer Book T100TA-C1-GR has an IPS screen with a resolution of 1366x768 pixels, is powered by an Intel Atom Z3740 (4x 1.33 - 1.86 GHz, no Hyper-Threading, TDP: < 4 watts) alongside a 2 GB working memory and a small 32 GB eMMC. A special feature of its keyboard dock is the full-sized USB 3.0 interface. Asus' tablet was found for below 330 Euros (~$369) at test time. The tablet with a weight of 582 grams and a thickness of 9.3 mm is completely made of plastic. Like most of its kind, it could be warped to an extent without much effort and produced a slightly alarming cracking noise. However, the Miix 3 is stiff enough for routine use. It should easily survive transportation in stuffed bags where certain forces might be applied. The back part is a tray that is pulled up to the front and holds the screen. 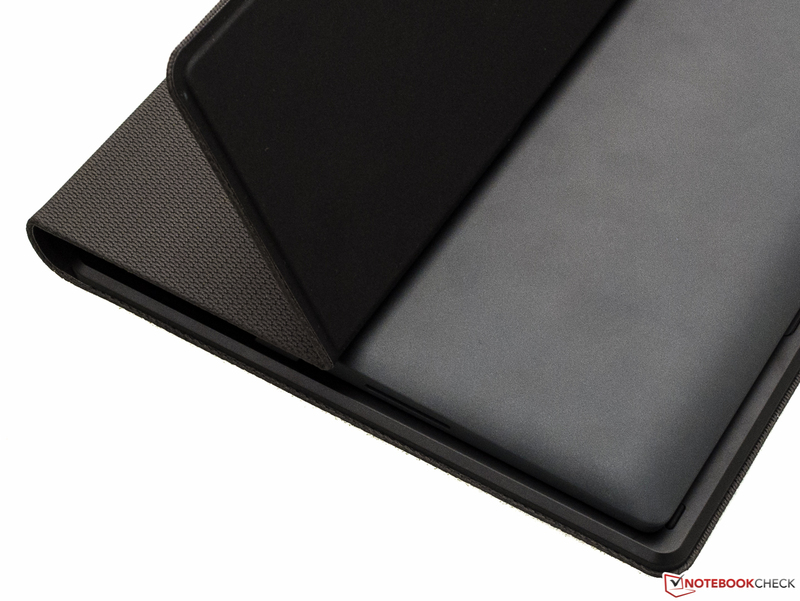 The tester finds that the matte-black, non-slip and velvety surface has a nice feel. Although fingerprints are visible they are not too obvious. 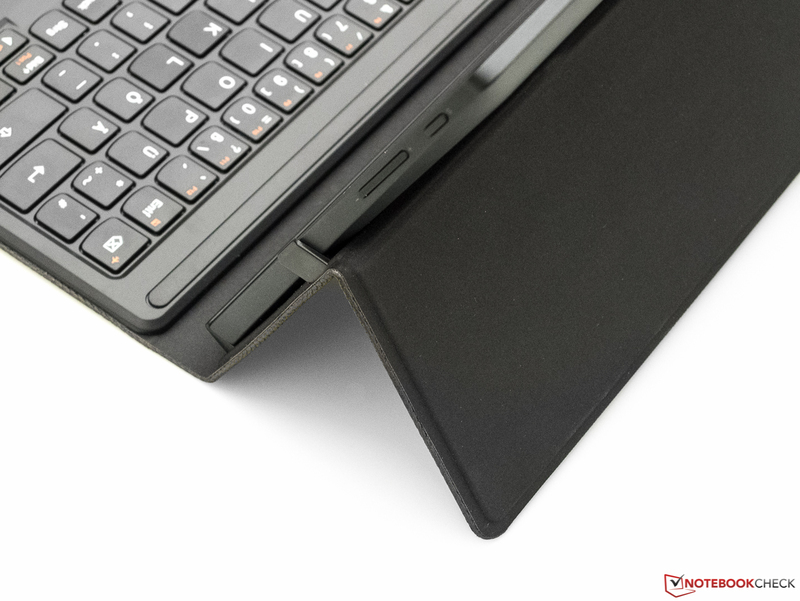 The lower part with the contact is level with a beveled edge to give the tablet a secure hold in the cover. Thus, the corners and edges are more pronounced here than on the upper edge. This was no problem for the tester. Should the edges press into the hands after a while, the device can simply be turned around. We did not notice any major drawbacks in build, although the gaps between the tray and display glass are not even everywhere. The impression and stability are more than satisfactory in view of the price. 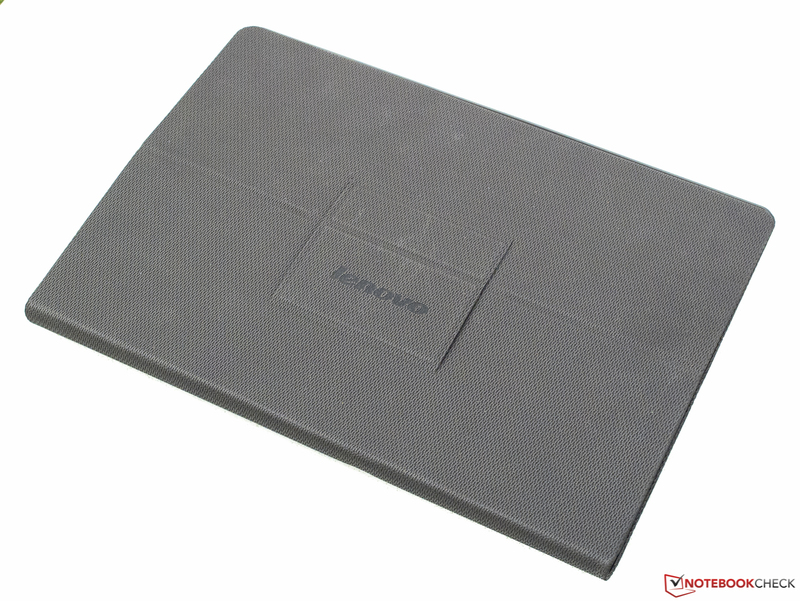 As to the cover: Its charcoal-gray outsides feature a nice textile pattern that, however, proves to be structured rubber when touched. It is very slip-proof and solid but also receptive for difficult to remove smudges, which can best be eliminated with a moist sponge. The part above the base is separated horizontally in the middle and can be folded over to form a stand. Two clasps are under the middle; a strong magnet with the contact is on the underside. The tablet is placed on it and pushed into the clasps. Inserting and releasing the tablet was no problem. 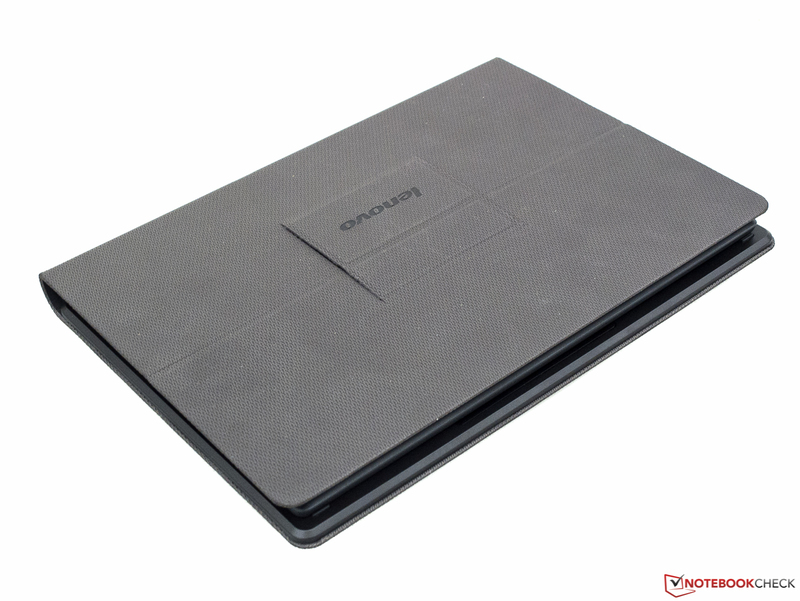 It has a secure hold, and the cover's protruding edges protect it and the base on all sides. 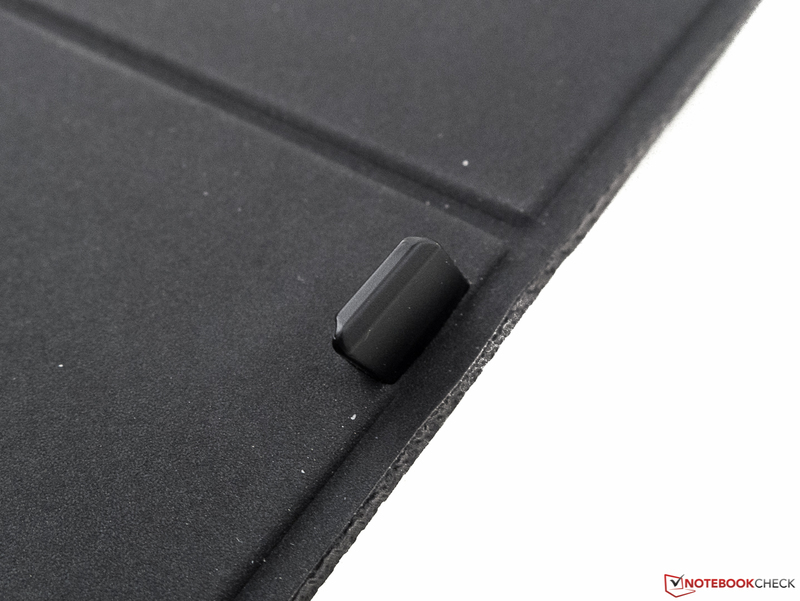 Small stoppers prevent the glass from closing directly onto the keyboard. The cover has a weight of 473 grams. That adds up to 1055 grams with the tablet. As mentioned in the intro, the build does not allow for a generous connectivity. A micro-USB 2.0, micro-HDMI and a 3.5 mm audio jack are found on the lower left. The micro-SD card slot, which is covered by a clasp when inserted into the cover, and the mono speaker are above that. The power button and volume rocker are in the upper right. These controls have a relatively high resistance but can be used well and are also easy to find owing to their palpable pressure point. We used a USB-OTG cable to simultaneously work with an external mouse and a connected hard drive (w/o dedicated power supply) and also to recharge the device. The power supply and a USB hub were connected to it. That functioned without problems; the HDD's data transmission rate reached the USB 2.0 limit. However, the device generally did not want to boot when only the hard drive was connected to the port. Thus, we could first connect it after booting. 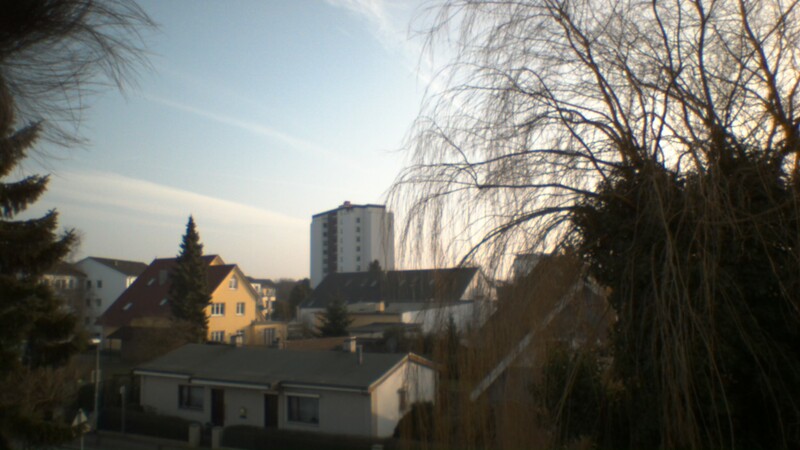 The 2 MP webcam fulfills its purpose aptly, but not more as can be seen in the screenshots. It shot relatively low-noise but a somewhat pale picture in a neon illuminated room. In worse light conditions, such as in a room only illuminated by a desk lamp, visible noise becomes evident. That is, however, still tolerable compared with other cams. The Realtek RTL8723BS is an especially compact Wi-Fi module that supports IEEE 802.11 b/g/n and Bluetooth 4.0. It can thus only transmit in the sometimes overrun 2.4 GHz band. Its reception performance proved to be well on average in the tester's personal setup. However, relatively strong fluctuations characterized it despite stable conditions. That was also true for the unsteady field strength display, which did not always scale to the actual transmission rate. A power supply unit with a 1-meter cord and the keyboard cover, as well as a quick-start guide, the usual warranty documents, and the license for Office 365 exhausts the included accessories. DIY maintenance and battery replacement are ruled out as is common for tablets. 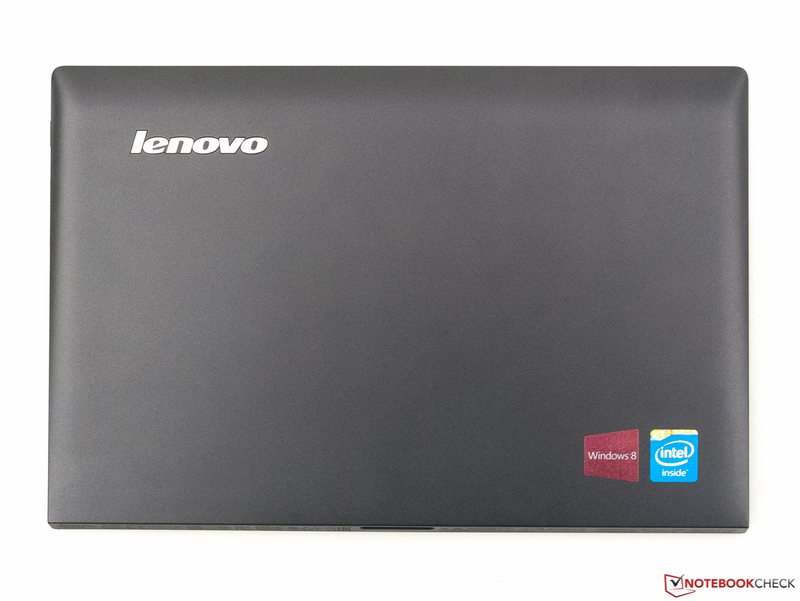 Lenovo includes a 24-month manufacturer's warranty that can be upgraded for a surcharge. As can be seen in the screenshots, the layout of the cover keyboard has a few peculiarities that cannot be avoided for space reasons. 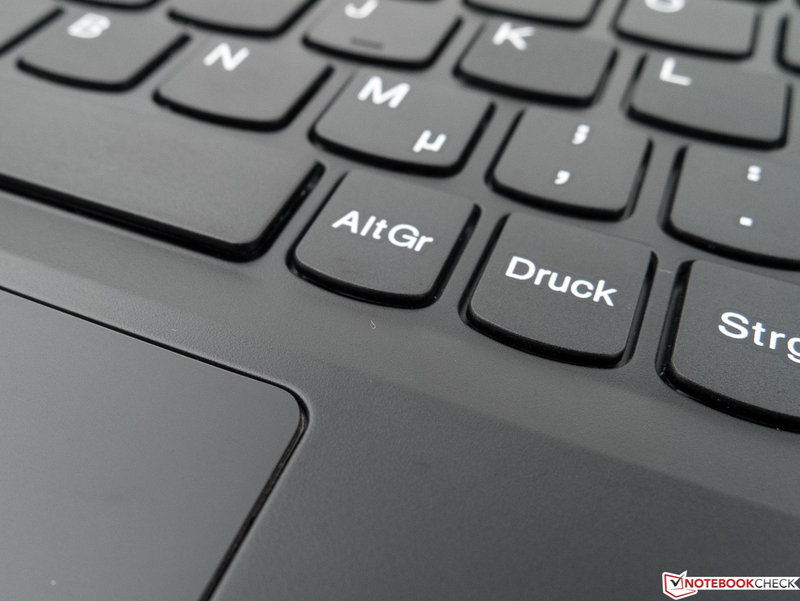 Some keys, such as the German umlauts Ö, Ä and Ü, have been scaled down, Print has been moved to the axed Windows key, the number keys have been mapped with the function keys, etc., and that needs some getting used to. 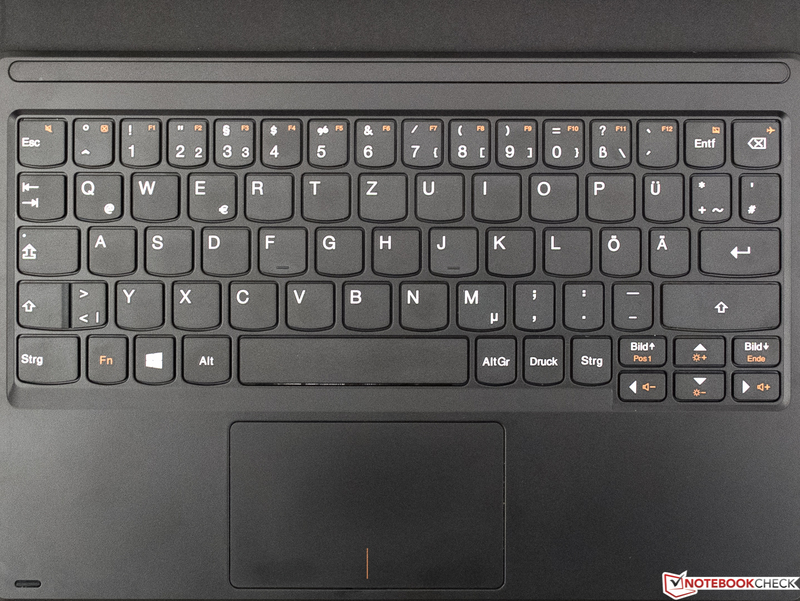 The advantage is the most important keys are almost full-size with normal spacing. That allowed the tester to mostly type smoothly despite his large hands. The key drop is naturally short, but the pressure point is crisp and the stroke is sooner soft and very quiet over the entire area. That could be favorable for prolific writers and/or use in noise-sensitive surroundings. 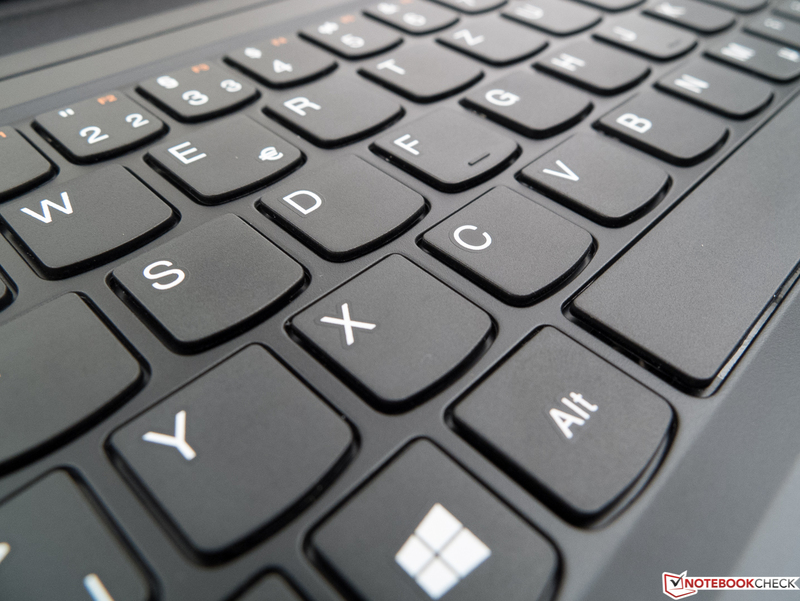 Overall, the keyboard of the Miix 3.0 surprised us pleasantly; it provides a more than useful solution for on the go and occasional work, and it is far better than any on-screen keyboard. The fact that the construction yielded slightly under pressure does not change anything about that, either. 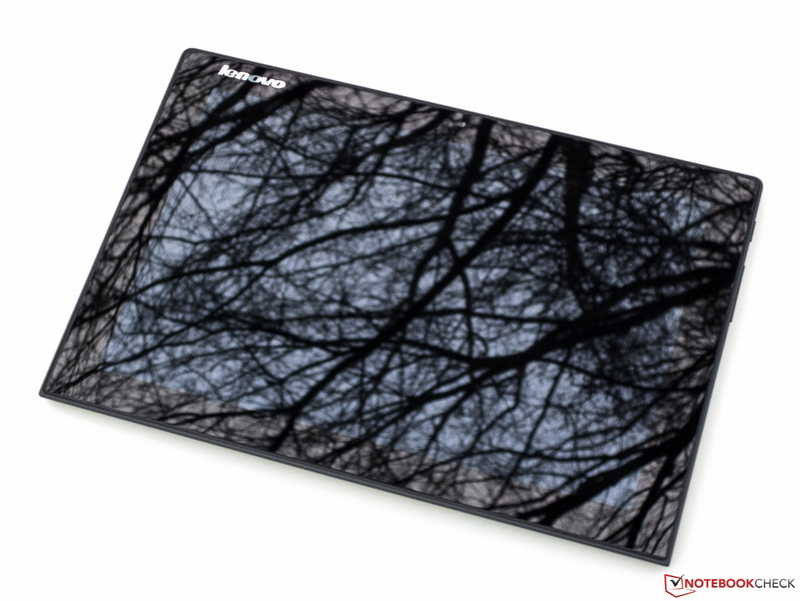 We would describe the 90 x 54 mm, sleek ClickPad without dedicated buttons as just satisfactory due to its quirky behavior. For example, swiping and gestures had to be performed from either the center or from below to trigger a response. The cursor first moved when we reached the center area when we started a gesture in the over 5 mm wide zone at the upper right or left edge. In contrast, gestures started in the center were implemented almost up to the outer edge. If that sounds too complicated - subjectively, the pad's behavior was characterized by occasional, annoying dropouts subjectively. We did not struggle as much with the mouse buttons, which feature an ideal resistance and a crisp pressure point, as well as a well palpable and audible feedback, in the tester's opinion. The manufacturer states that the screen detects up to ten fingers at the same time. Its responsiveness and accuracy were inconspicuous in the test, in a positive sense. Users who want to use it with the Windows desktop should buy a stylus in order to hit the small icons accurately. 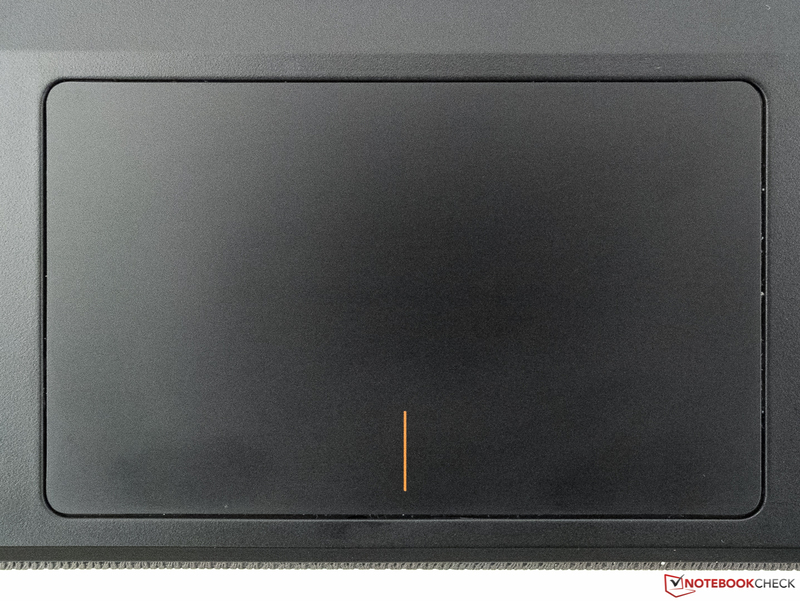 The maximum brightness of the IPS screen with a resolution of 1920x1200 pixels (16:10) of just 231 cd/m² (center) is very low for tablet conditions. It is clearly below the average of 297 cd/m² when adding up the rates of all convertible from the past twelve months. Neither contender achieved a much better rate in the test. Subjectively, the illumination of 85% is satisfactory; we did not ascertain clouding or screen bleeding. In our opinion, the image sharpness was also impeccable. 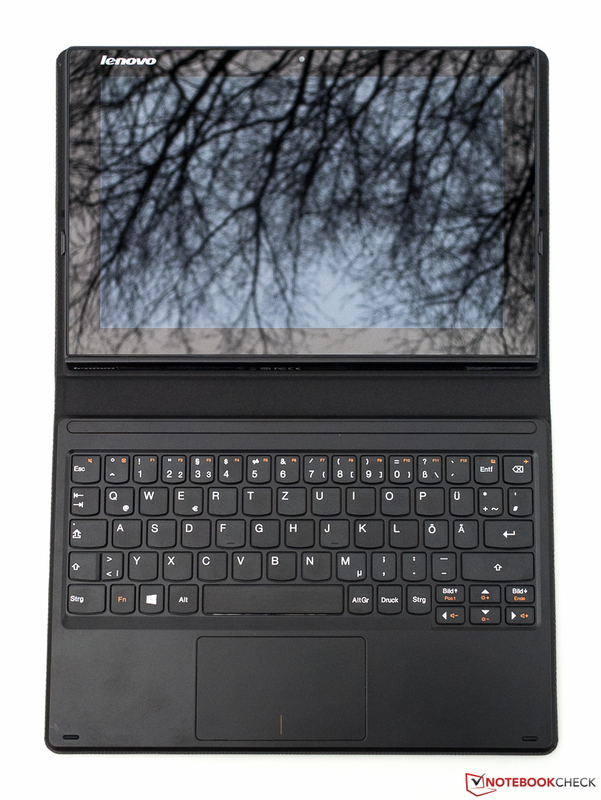 Owing to the agreeably low black level of 0.22 cd/m², which also ensures a relatively deep black subjectively, the contrast of our Miix 3 10 is an excellent 1050:1 despite the low brightness. 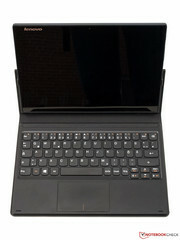 Asus' Transformer Book can compete with that, while the ODYS Winpad takes the last place with its still very good 809:1. As for color reproduction: The DeltaE rates, which describe the shift from the ideal, of 6 (ColorChecker) and 8 (Grayscale) are nothing to brag about for an IPS screen. Good members of this category remain below 3, some low-cost TN screens achieve well above DeltaE 10, which is very visible when compared to a calibrated screen with correct reproduction. 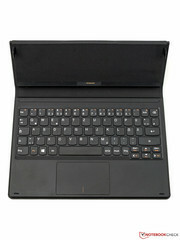 Therefore, the high rates of the Winpad also with an IPS screen are unsatisfactory. Unfortunately, we cannot provide any data about the color-space coverage, which is primarily important for professional image editors. Our CalMAN software recurrently crashed on the Atom platform. 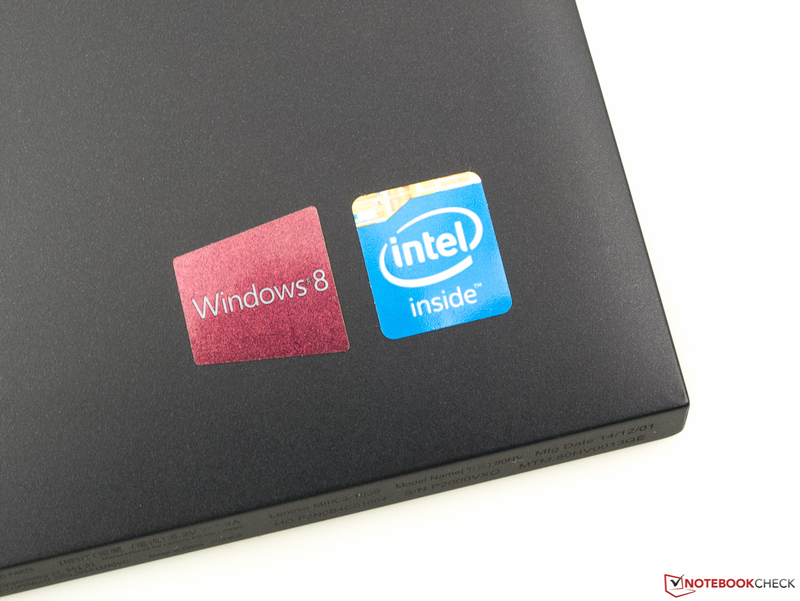 However, it should not be a problem to outperform the relatively low rates of the Winpad and Transformer Book. 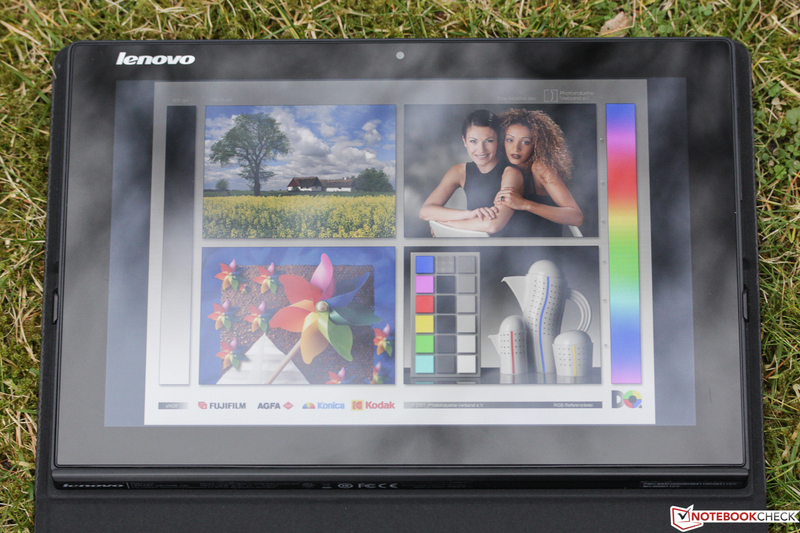 We could only test the screen's outdoor suitability under cloudy skies and did not have many problems with its legibility under these conditions. 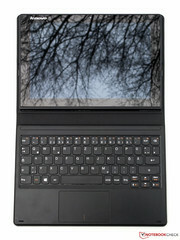 The user should only make sure that the sky or other bright areas are not reflected in the screen. In our experience, the mediocre brightness alongside the glossy surface will likely result in too low contrasts in both very bright surroundings and in the shade. Thus, potential buyers who are planning to use the convertible outdoors in the summer should perhaps look for another alternative. Typical IPS: Noticeable deviations are first seen when looking at the screen from a very slanted view both vertically and horizontally. Since that is rarely the case in practice, we can rate the viewing-angle stability of the Miix 3 10 as very good. The user will only have to accept minor brightness or contrast losses when looking from the sides or from above or below, which is the case in virtually every screen. 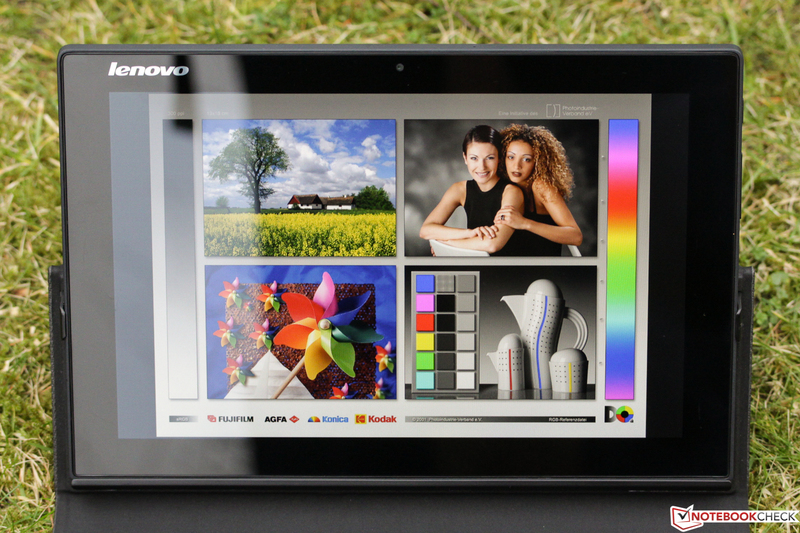 Both the computing and graphics performance of Lenovo's Miix 3 10 are very low compared with other Windows systems. That is particularly true for the per-thread performance. However, there are enough reserves for most office and multimedia applications. More demanding programs, such as Adobe Photoshop Lightroom, run sluggishly. 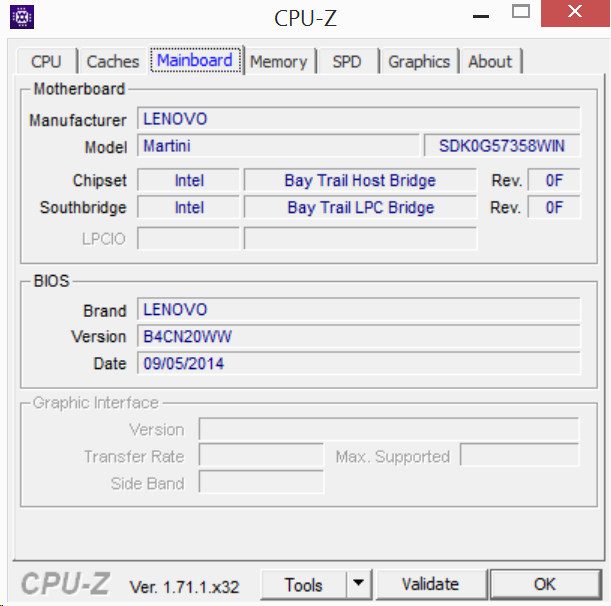 Lenovo opted for the 32-bit version of Windows 8.1 to spare storage capacity and resources. Thus, pure 64-bit software will not run. 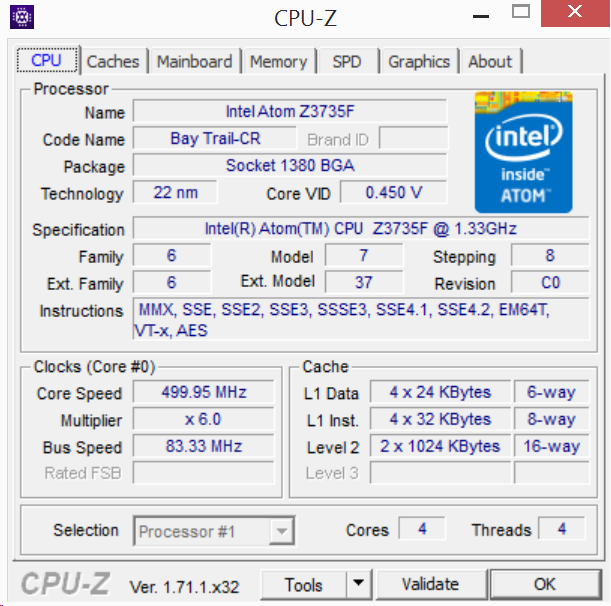 The energy-efficient Intel Atom Z3735F (Silvermont architecture) has four cores with a base clock of 1.33 GHz and a maximum of 1.83 GHz. Compared with older Atom models, the per-MHz performance has allegedly been increased by up to 50%. However, the virtual core multiplier has been axed. Its low TDP of below 4 watts makes it suitable also for passively cooled tablets and convertibles, such as the review sample. We will not go in-depth about this SoC since it is found in many of the tested devices that we have reviewed. Instead, we would refer to the article about the SoC, which includes many benchmarks. The SoC's performance level is exactly where expected when using Cinebench R10 (32-bit). There are no big differences compared with the identical or very similar SoCs in Asus' Transformer Book and the ODYS Winpad. The frequency of all four cores remains stable at approximately 1.5 GHz when loaded. That is also maintained in battery mode. The power is easily enough for displaying the Windows 8.1 UI smoothly. The relatively lag-free use and the speed with which programs opened pleased us, although it was not lightning fast. At least an eMMC supports the rather weak SoC, which is literally half the battle in this case. PCMark 7 did not exhibit any notable performance differences between our three comparison devices, unlike PCMark 8 which sees the review sample 9 to 15% behind the ODYS Winpad. We will see whether we find the reason for that in the next section. To say it upfront: The browser benchmarks, which barely access the storage device, see both convertibles almost exactly on par again. 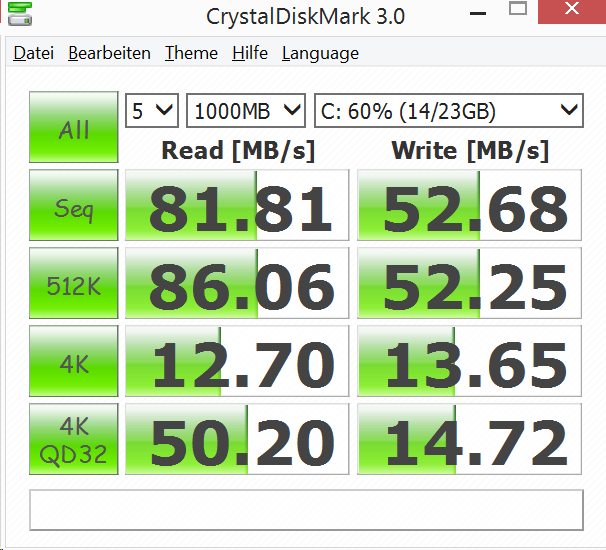 We had to rely on CrystalDiskMark 3.0 for assessing the storage device performance after the AS SSD benchmark, specialized for SSDs, refused to run. 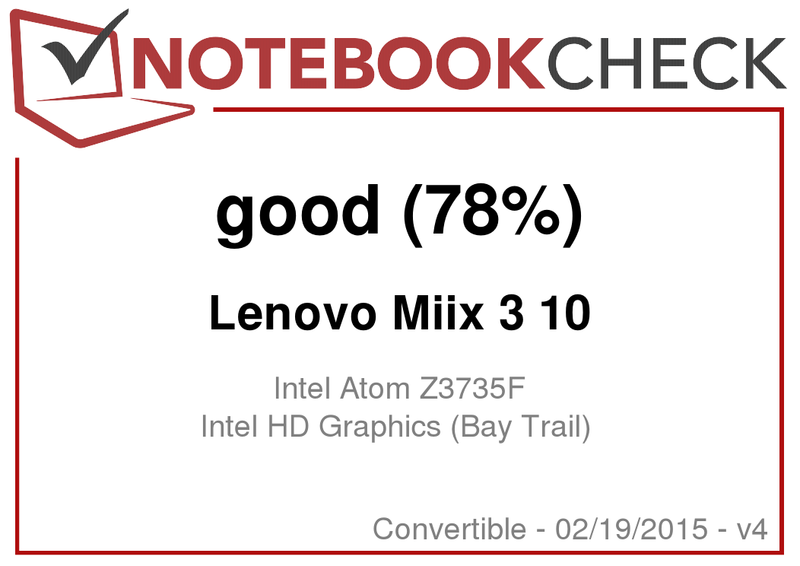 It presented a surprising weakness in the Miix 3's 32 GB eMMC in sequential read, which could also be the reason for the lower score in PCMark 8. The transfer speed of just 82 MB/s would not even look good for a conventional hard drive. The ODYS Winpad achieves no less than a 103% higher data rate, and the Transformer Book also transfers 33% more data through the lane. The Miix 3 10 did strikingly well with simultaneous reading of small data blocks using multiple threads (Read 4K QD32), which is to simulate system and operating system starts. 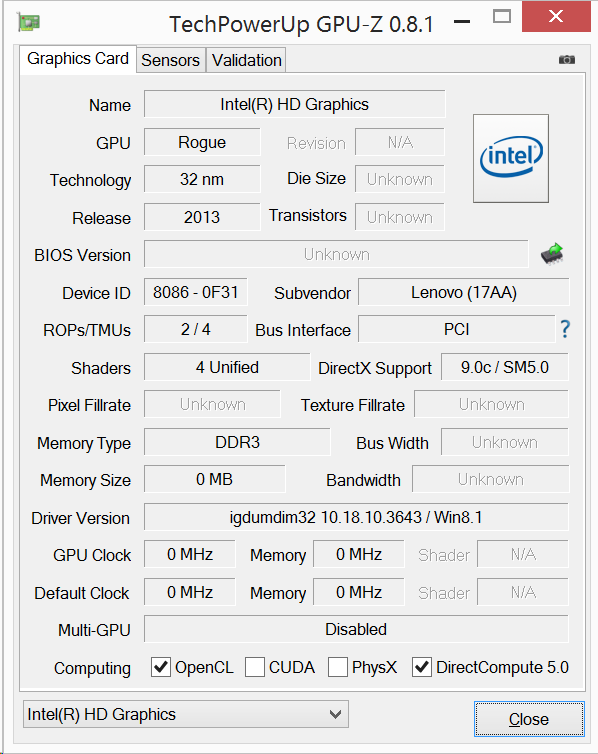 Intel's HD Graphics is located in the absolute low-end range. Although it supports DirectX 11 on paper, it only has four, relatively slow-clocking execution units, and it only outperforms the performance level of older, ARM-based SoCs, such as the Adreno 320 integrated in Qualcomm's Snapdragon S4 Pro, by a hair's breadth. However, rendering high-resolution videos up to 4K is no problem owing to the support of common codecs like H.264. Compared with other devices based on the same SoC, Lenovo's Miix 3 10 achieves inconspicuous results in the 3DMark graphics tests, which are, of course, on the lowest level. While there is still enough power for most Android games or games from the Windows Store, the GPU fails in rendering virtually every fairly up-to-date 3D Windows title. Even older games with isometric images like StarCraft II or Diablo III only run smoothly in the lowest settings, if at all. What works are two-dimensional indie games, such as the atmospheric, highly awarded Limbo. The surface temperatures climbed to 50 °C in some places, which is already perceived as very warm, during high permanent load and will unlikely occur in practice. It is, however, interesting that they barely surpassed an uncritical 36 °C in idle mode. Thus, no problems should evolve in routine use. Our observation of the core rates during the stress test confused the tester, and a reproducible pattern was not evident. A detailed description of the erratic behavior would go beyond the scope of things and would not provide any useful insights. However, we can say that throttling is unlikely in realistic conditions. The mono speaker on the tablet's left does not achieve an especially high volume. It will not fill more than a small room with sound. Although the sound is clear and suitably differentiated, it is also very mid-heavy, flat, and it consequently lacks dynamics. Therefore, it cannot convey a surround feeling. We cannot complain about volume fluctuations or distortions. The speaker is suitable for Windows sounds and speech. External speakers or headphones should be used for music and videos, though. Compared with the ODYS Winpad, the review sample proved to be extremely guzzling in the different idle load levels. The difference to the only slightly more frugal Asus Transformer Book is considerably lower. The average load of the devices is close, although the ODYS Winpad consumes 25 and 29% more energy in maximum load than both other convertibles. The average idle consumption of 5 watts is on average when considering all equally sized tablets tested in the past twelve months. The power supply is a bit too weak and could only recharge the device very slowly in maximum brightness. We would guesstimate a charge time of up to eight hours. A script automatically opens representative websites every 40 seconds using a brightness reduced to approximately 150 cd/m² for our real-world Wi-Fi test. The achieved runtime of over six hours, which the ODYS Winpad also accomplished, should be enough for most purposes. However, it is bottom of the barrel compared with other 10.1-inch tablets with an average of 530 minutes. Users who need considerably more should look at the Transformer Book with almost eleven hours. All said, and with special consideration of the low price of just 299 Euros (~$334), Lenovo's Miix 3 10 convertible made a good impression. The screen of a device so obviously made for mobility could definitely be brighter, but its contrast was particularly compelling. Lenovo's primary intention for its convertible's use becomes evident in the license for MS Office 365, and its performance is also easily enough for that purpose. The processor operates as expected considering its low level and mostly ensures smooth use in conjunction with the overall mixed, and in our opinion, too small eMMC. The manufacturer has to be praised for the robust and well-conceived cover. Its keyboard comes as close to a standard keyboard as its size allows. It is too bad that the ClickPad cannot quite keep up with that. Although the bundle does not convey a high-quality feel, it makes a very solid and above all practice-suitable impression. The battery life was not first-rate in the comparison, but that will not thwart mobile use. The tablet can also be used as a mirror in a turned-off state. ...but it is a rubber-coated surface. 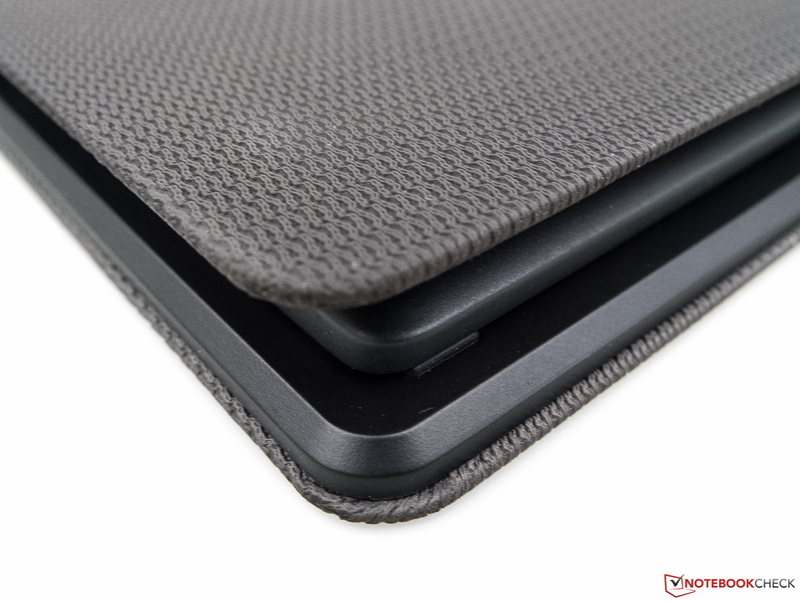 A closeup of the flat and sleek ClickPad. ...and one of the two clasps. ...it is protected against shocks. The cover without the tablet (stand mode). The well-conceived keyboard cover alongside its decent keyboard. The clock fluctuations during the stress test defy analysis.